I can’t lie. Nor do I think I ought to. 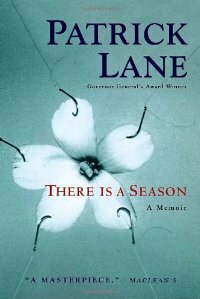 On reading the first chapter of Patrick Lane’s There is a Season I felt mostly annoyed. I didn’t think I’d make it to page fifty, which is my official limit…[page 100 is my un-official limit]. If I haven’t engaged in a book by then I close it and move along. I can’t say what it was that bothered me, I just couldn’t get with the rhythm, I wasn’t paying attention. I kept reading, pages and passages in no particular order. And then I started again, at the beginning. This is the opening. What, exactly, about that is cranky-making?? I’ll tell you what: nothing. Whatever my initial reading mood was, I’m thrilled it passed. It’s a book of poetry in the form of prose. Or vice versa. It’s a meditation. You read it slowly, and maybe that’s what was wrong on my first attempt. My speed setting was off. The book is also about sobriety although drinking is rarely mentioned. It’s Lane’s senses that are sober for the first time in forty-five years and so the reader is privy to the perspective of not only a great poet, but of someone who’s been issued a set of fresh eyes, ears, skin and taste buds. There are many references to rain and mist and dew, pools of water, as if the booze has been replaced by more useful forms of liquid, ones that help him think—and remember—more clearly. The book is divided between the present day Victoria garden and the past: childhood, parents, marriage, failures, joy, sadness and one especially incredible scene where he returns with his now elderly, unemotional and extremely reluctant mother to the old homestead; it’s near the end of the book and is one of the best passages I’ve read anywhere for its power to convey, essentially, a whole world, the now and the then, in a few sentences. Perfectly placed. I’ve since returned the library copy. And purchased one of my own. Very nice. And I can relate! My reading mood definitely changes. Lovely Carin — and I do like hearing about how others engage and/or don’t (or sometimes both) with a book. Thanks, Maureen. Me too. There are so many books that don’t immediately strike a chord, for whatever reason… mood, timing, etc… but there’s something about them that’s ‘un-put-down-able’. I will slow down, Carin, perhaps begin again at about half past the middle where I got ‘bothered’ … not sure how or why. My beginnings with the book were opposite to yours, loving it, then something fell away …? A couple of my favourite lines at page 143: “The past … is a small house with many windows. I stare from each one at myself.” And, “When metaphor becomes reality it stops the spirit.” Thoughts? Yes! That whole reflection that begins on p.139 with the ‘innocent’ memory of St. John’s Wort and then travels through such murky, personal childhood territory and then, standing there in Crete, with Lorna, being struck at “how small history is”. Brilliant. The line you quote about the house with windows… gorgeous. “The past is the present illuminated.” I love how he travels through these memories, the way he navigates the honesty of them, because that’s how memories come to us… in fragments, neither prettified nor melodramatic. I’m guessing he’d never have been able to face or see any of it as clearly under the influence of booze. But he rarely mentions that bit.